Each Thanksgiving for the last few years, I've made VeganDad's Seitan Turkey, not so much for dinner, but for day after sandwiches. Outside of my Sausage Stuffing, Turkey sandwiches were my favorite, and VeganDad got me through my first meatless Thanksgiving. It struck me this year, that I could make gravy as well. I took VeganDad's 'turkey' spice combination and began playing with proportions. After a couple batches and a tester who's acutally had turkey in the last three years, and I arrived at a winner. If you like VeganDad's turkey, you'll like this. If you haven't had his turkey seitan, I highly recommend it. Combine the nutritional yeast and spices and set aside. Melt the margarine in a sauce pan over medium heat. Add the flour and stir constantly for a couple minutes, allowing the flour to cook a bit. Add the spice mix, stir and cook for a minute longer. Remove from heat and add in the water and liquid smoke. Return to heat and bring just to a boil over medium high heat, stirring constantly, probably 5-10 minutes Test for seasoning and serve. This gravy is especially good with a few dried cranberries stirred in. Yum! I may have to make this for my meat eating family. It sound so flavorful and easy! Ooooh yessy! Sounds good and now I'm off to check out vegan dad's roast. I can't believe its almost Thankgiving. How fast did this year go by?! I might have to try this recipe. I usually just do a simple vegetable stock gravy. This one sounds much tastier! Oh serendipity, how do I love thee? As we type, my version of Turkey Style Seitan is finishing in the oven. 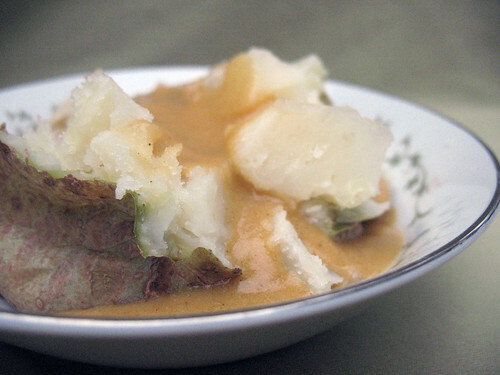 It was first inspired by recipes at VeganDad and Thrifty Living, and I was just today pondering on a suitable gravy recipe to go with it- score! Thanks for a perfect match! Oh man. That looks like the gravy from my childhood!